National Master Michael Yang is a two time junior high state champion, a four time high school state champion, a two time national scholastic champion, and a two time All-American team member. He was the captain of the Eden Prairie High School chess team for four years, and he led the team to four state championship titles. He also authored U.S. Chess Comes to Seattle, the 6th best article of 2010 for the national chess magazine Chess Life. 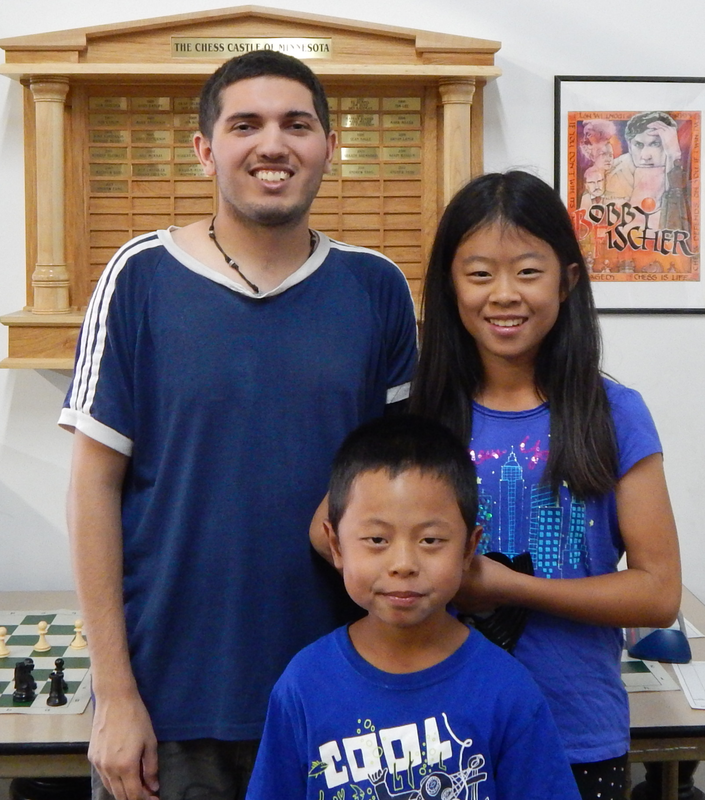 He has had five years of experience teaching young chess players. Michael started playing chess when he was six years old. He became an expert at the age of 11 and a master at the age of 13. He represented Minnesota at the Denker Tournament of High School Champions three times, and finished in second place twice. Attending many prestigious chess camps over the years, the most notable being the invite-only US Chess School, and has been a volunteer coach at several chess camps. Michael is studying Computer Science in the College of Science and Engineering at the University of Minnesota Twin Cities. Michael is also available to do chess teachings outside the Castle . National Master Kevin Bu started playing chess when he was six years old. In 2004, he won the MN State Elementary Championship when he was in the second grade. He was invited to represent the US in the 2006 World Youth Chess Championship. The same summer, he went to a prodigious chess camp in Beijing, China that was hosted by a group of national level chess coaches in China. His chess skills improved a lot after his training in China. He is a three-time national scholastic champion, taking first at the 2007 National Youth Action K-6 section, the 2009 US Junior Open, and the 2010 National Junior High Championship. He became a national master in 2010. He was the MN State High School Champion in 2012, and he received the honor of representing Minnesota at the prestigious Denker Tournament of High School Champions that summer, where he took third place. Again in 2014 taking 1st place at MN State High School Champion and representing the Denker Tournament. Kevin has five years experience teaching chess. He taught a class for three years at the Minghua Chinese School for three years. Kevin has taught chess at the castle two years and he was the Captain of the Eden Prairie High School Chess Team for four years, during which the team has achieved outstanding awards for their performance. Along with other awards involving Destination Imagination; one of the largest creative problem solving challenges in the world, twice receiving first place at the 2007, and 2010 Global Finals. Tremayne Talbot is a chess enthusiast and has ten years of diverse teaching experience. Tremayne has previously taught at both Hans Christian Anderson Elementary and Middle School. He also was the coach of the Eden Prairie High School Chess Team for multiple years in which they received tremendous awards and standings for brand new teams taking home first and second. You can find his own personal experience being raised from Southwest High School in which he received many awards on his own accord.